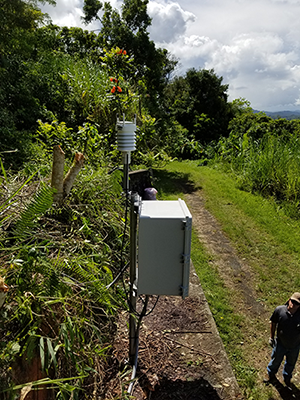 Newly installed infrasound sensors at a Global Seismographic Network station on Puerto Rico recorded the sounds of Hurricane Maria passing overhead. The instruments installed at Global Seismographic Network (GSN) stations were designed to record Earth’s vibrations, but they sometimes pick up sound waves from unexpected sources. For example, newly installed infrasound sensors at a station on Puerto Rico recorded the passage of Hurricane Maria on 20 September 2017. Just how useful are the instruments at GSN stations to scientists who seek to expand our information on hurricanes? Data from Hurricane Maria suggest some untapped potential. Streams of geophysical data from GSN stations worldwide are a rich, readily accessible source of information that can offer insights into not only Earth tremors but also a wide range of other geophysical phenomena, including hurricanes and other severe weather events. This is particularly useful in remote areas, where data from other sources may be scarce. The GSN is a permanent, digital network of more than 150 modern stations in more than 80 countries. The primary sensors of the GSN are broadband seismometers with high dynamic ranges that respond to vibrations over a wide range of frequencies. These instruments can record the strong ground shaking of a large earthquake with high fidelity, but they are also extremely sensitive to very small signals. The seismometers can detect Earth’s tides with periods of tens of thousands of seconds. They can pick up signals generated by ocean swells (recorded as 6- to 18-second microseisms). These signals can be detected across the entire planet, regardless of distance from the ocean. Other sensors—such as microbarographs, anemometers, magnetometers, and GPS receivers—are commonly installed alongside GSN seismometers to help identify other sources of noise that may mask seismic signals of interest. But these instruments may have useful data in their own right. So in effect, these stations serve as geophysical observatories. In 2016, the GSN began installing infrasound sensors at selected stations. These sensors respond to sound waves with frequencies below the lower limit of human audibility (which is typically about 20 hertz). As of June 2018, 13 GSN stations had infrasound sensors. The new instruments have several scientific purposes. One is to gain a better understanding of the infrasonic wavefield (which may be generated by a variety of natural and human sources) that may couple with the ground at GSN sites and leak unwanted signals into the seismic wavefield. A second purpose is to improve monitoring of natural events, such as volcanic eruptions, meteor explosions, landslides, and severe storms. Scientists are also keen to learn more about man-made signal sources, such as rocket launches and detonations. The instruments can detect these events in remote parts of the world where there is limited geophysical scientific infrastructure to record them. A third is to use infrasound recordings across the broad geographic coverage of the GSN. This information can improve our understanding of global atmospheric dynamics. The infrasound sensors deployed in the GSN are most sensitive in the 0.02- to 15-hertz range. To suppress wind noise, infrasound sensors are usually deployed with a rosette-style, or cloverleaf-shaped, spatial filter with a 10-meter aperture. The design of this noise-reducing system is flexible enough that it can be configured to meet spatial constraints unique to individual GSN stations. An unexpected opportunity to observe the monitoring capability of these new sensors presented itself on 20 September 2017 when the eye of Hurricane Maria passed near GSN station IU-SJG, where an infrasound sensor had fortuitously been deployed only a few weeks before (Figure 1). Maria, formally identified as a tropical storm on 16 September, had intensified rapidly, earning recognition as a hurricane within 1 day and as a major hurricane within 2 days. Maria made landfall in Puerto Rico near Yabucoa, about 63 kilometers east of the GSN station, around 0635 Atlantic Standard Time (1035 Coordinated Universal Time) on 20 September. 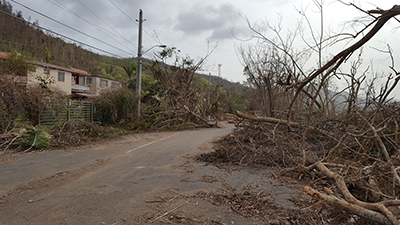 At the time of landfall, a sustained wind of 96 kilometers per hour, with wind gusts up to 182 kilometers per hour, was reported at Yabucoa Harbor. Approximately 90 minutes later, the center of Maria’s eye came within about 11 kilometers of station SJG, and the National Oceanic and Atmospheric Administration’s National Hurricane Center recorded a minimum central pressure of 921 millibars (0.909 atmosphere). 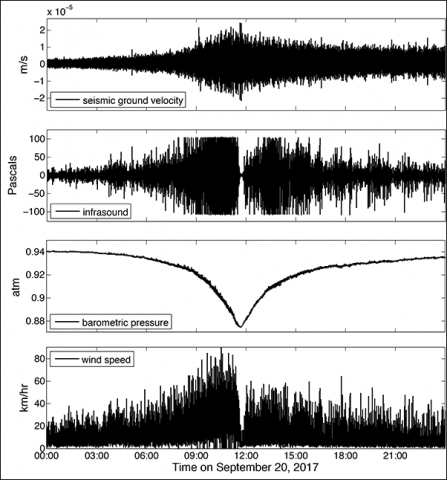 Instruments at station SJG recorded a variety of geophysical signals—ground shaking, barometric pressure and wind speed, and infrasound intensity—on 20 September as Maria approached and receded (Figure 2). Fig. 2. 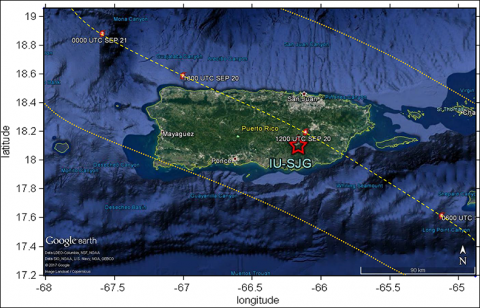 Geophysical data from GSN station IU-SJG in Cayey, Puerto Rico, for 20 September 2017. The four panels, from top to bottom, show seismic data, infrasound data, barometric pressure, and wind speed. The data cover 1 day, and power failure took the station offline shortly afterward. Note the dip in infrasound signal and wind speed at about noon, when the eye of the hurricane passed overhead. Data from the microbarograph at SJG show that the atmospheric pressure dropped from about 0.94 atmosphere (952 millibars) to just below 0.88 atmosphere (892 millibars) as the hurricane approached. The station is located 420 meters above sea level, so the measured pressure is lower than what would have been observed at sea level. The infrasonic pressure and wind speed steadily increased until around the time that the eye was nearest the station. Amplitudes of both stayed low for several minutes during the calm conditions within the hurricane’s eye. As the eye of the storm receded, the barometric pressure rose again, and the wind and infrasound increased as well, but not to the extent experienced during the storm’s approach. The infrasound signal, which was most likely caused by local wind turbulence, did not reach the levels seen while the eye was approaching because the wind speeds were not as great as the eye moved away. The maximum wind speed recorded at the station was 90.4 kilometers per hour (25.1 meters per second). However, the wind sensor at IU-SJG is mounted only about 2 meters above the ground and is flanked by high topography that would have protected it from the hurricane-force winds, which exceeded 118 kilometers per hour in that region (Figure 1). The infrasonic signal reached the upper limit of the instrument’s recording capability: The instrument records pressure changes as large as ±100 pascals. This sound level is in the range of the noise that a jet engine produces at a distance of 100 meters (although in a different frequency range). 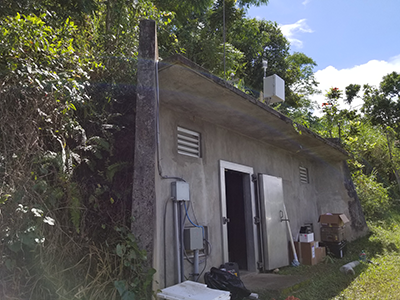 The measurements made at GSN station IU-SJG during Hurricane Maria provide a striking example of the role that such stations can play as geophysical observatories, not just for seismic studies but also in investigations of atmospheric dynamics and other geophysical processes, particularly in remote areas. In this example, researchers need finely detailed data on barometric pressure and wind speeds on the ground across a hurricane’s width so that they can better track a storm’s evolution and ground truth any models of the storm’s progress. GSN stations, through the suite of instruments they contain, could provide such data. As of June 2018, infrasound sensors have been installed at 13 GSN stations around the world. All GSN data are freely and openly available to the public and to scientists around the world from the Incorporated Research Institutions for Seismology (IRIS) Data Management Center. We look forward to the scientific community finding new ways to use all of the diverse geophysical channels of the GSN. The Global Seismographic Station network was formed as a partnership involving the U.S. Geological Survey (USGS), the National Science Foundation, and IRIS (a university consortium). The network, which is operated by the USGS Albuquerque Seismological Laboratory and University of California, San Diego’s Project IDA with a subaward from IRIS, serves as a multiuse scientific facility and societal resource for monitoring, research, and education. David C. Wilson (email: [email protected]), Albuquerque Seismological Laboratory, U.S. Geological Survey, N.M.; Peter Davis and Carl Ebeling, Institute of Geophysics and Planetary Physics, Scripps Institution of Oceanography, University of California, San Diego, La Jolla; Charles R. Hutt, Albuquerque Seismological Laboratory, U.S. Geological Survey, N.M.; and Katrin Hafner, Incorporated Research Institutions for Seismology (IRIS), Washington, D. C.
Citation: Wilson, D. C., P. Davis, C. Ebeling, C. R. Hutt, and K. Hafner (2018), Seismic sensors record a hurricane’s roar, Eos, 99, https://doi.org/10.1029/2018EO102963. Published on 03 August 2018.